The arts scene in Sutton is alive and well as always and Knowlton residents and visitors to the EasternTownships have another fresh new exhibit to visit. What better way to escape from the snowy reality of winter than to enjoy some bright paintings by our talented Quebec artists. Starting January 18 Anna Nixon will have a solo exhibition at Arts Sutton titled Multiples and Multiplication. The Montreal artist will present us with an ironic commentary on contemporary reality. The young artist, who is holding a degree in Visual Arts from Concordia University in Montreal, uses repetition of persons or objects in her paintings to create an echo effect in her works. 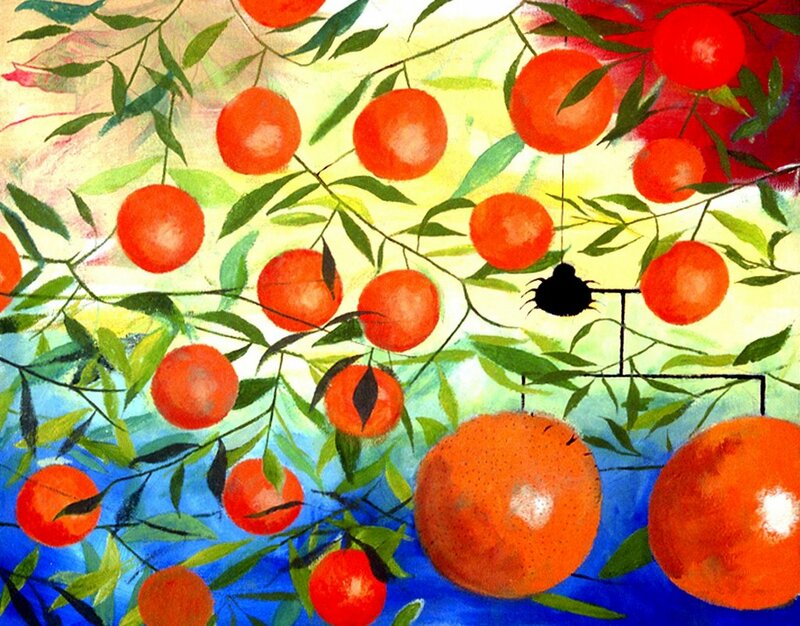 A spider spinning its web across a panoply of oranges, a multitude of red barns of different sizes that seem to be drawing a diagram, disciplined looking people being pulled by strings, just to name a few the artist will be presenting in her show. Though working mainly with paint, Anna Nixon is attracted to any medium that allows her to give form to her ideas. Anna Nixon works as a Visual Arts teacher at the English School Board of Montreal. She has participated in a number of group shows across Canada. Her works are owned or are a part of public as well as private collections. The show will be held until February 14. The vernissage will take place on Saturday, January 20 between 14:00pm and 17:00pm.